Yesterday, we completed a physics demonstration: The adjustable see-saw. This seesaw has holes drilled into the balancing beam, allowing students/users to experiment with the capabilities of numerous levers. You just shift its position along the beam and viola! Instantly, a foolish grin hits your face as you try to balance anew. A pretty simple build in which I learned two things: drilling large diameter (1 1/2 inches in this case) holes at a ninety degree angle can be challenging. My students drilled out the hole centers with a 1/4 bit and then bored out the rest with hole saw. The hole saw bit isn’t deep enough for 2x lumber, so we attacked the piece from two sides. When the two kerfs met, the core just popped out. It was ugly but it worked. Next time through, I will use a small tri-square to check squareness while cranking on a handbrace. Which means I oughta scrounge up a brace & auger set for the kids. I know I have a brace somewhere, I just have to price out auger sets…. 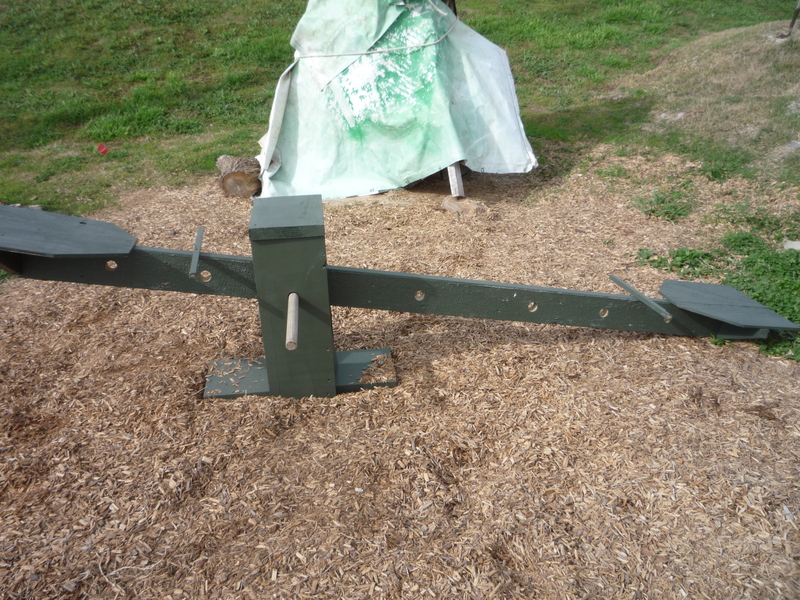 Secondly – did you know that handles are essential to the see-saw experience? A see-saw without handles is a death trap. The see saw doesn’t rise more than two feet, but in the non-handled test run, I scared my pants off. Strange but true. Test it. Go sit on a seesaw and let go of the handle. See if your stomach doesn’t squeeze a bit. Make it saw & keep the rubber side down. That’s a neat project! It strikes a cord with me, because I just took the Technical Education certification test this past weekend. They had a question about calculating a levered system with two people of different weights. That’s a nice learning tool.